In this tutorial, you will learn about different factors that are taken into consideration before choosing your Analytics Platform both at the organization and individual level. I consider that you know how data is a big asset in a company to all levels whether he or she is an executive or director, Data plays a key role. But to possess a large amount of data doesn’t make a company successful until unless they are deriving valuable information out of it. The information is going to impact the revenue directly or indirectly. In order to derive the information out of the large data patches, there is a need of Analytics platform, and fortunately, there are numerous products present in our market to cater the problems of an organization in terms of descriptive, diagnostic, and predictive reporting. The maturity of data will increase from top to down inclusion of above points in an organization. Data maturity will go hand in hand with technology, architecture, organization and data strategy. By saying technology, I mean how an organization is going to utilize a piece of technology which was purchased by it. Architecture will be fitting these technologies together so that data move around them effortlessly. By Organization I will talk about the people who are interacting with the data. Improvements in data strategy: The plumbing aspects of data management is vital to the high performance of any organization. The data management practices adopted will give relevant and structured data to the analysts they require for analyzing data, and they will spend reduced time in data preparation. This will help the higher management to meet the objectives of increase in profitability, higher ROI via data visualizations and easy to understand representation of data. This will also help organization improvise on data performance and have optimized storage. Tableau presents a gold standard when visual analytics is discussed. Its variant is Tableau Desktop, Prep, Online, and server. Each enables self-service BI to different levels. Tableau desktop provides one of the best platforms for visual analytics and Business Intelligence with self-service insights. Tableau Prep empowers more people together for analyzing data faster. Tableau Online extends sharing and collaboration without having an actual Server. Tableau Server shares the data with actual servers that can be on-premise or cloud. For details on the development of dashboards in Tableau, please visit here. SAP SAP is a well-known name in the market of enterprise tools, providing solutions to companies with a varied number of profiles. SAP has launched several products in terms of Analytics; its own Business warehouse system provides integration with Enterprise in a much smoother manner and caters a large amount of data. 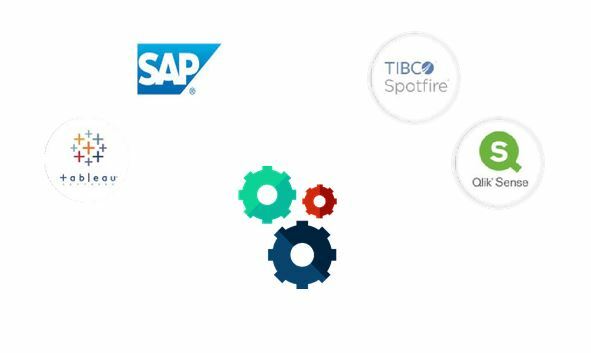 Its recent releases are SAP Analytics cloud and SAP Lumira, previously it acquired Business Objects and provided it as an analytic platform of its own. 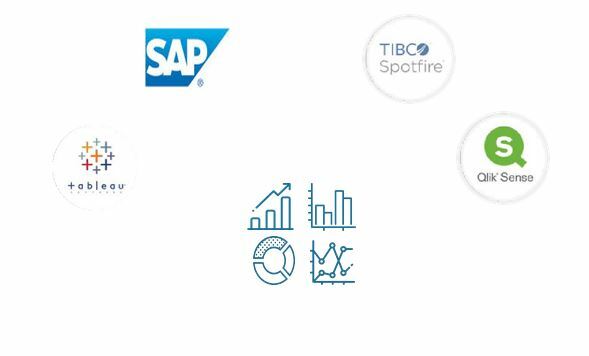 Tibco Spotfire Tibco Spotfire is one of the products that cater to advanced analytics and predictive analytics in a much professional and educated manner. It is very powerful when compared on the instance of Predictive analytics with other products. 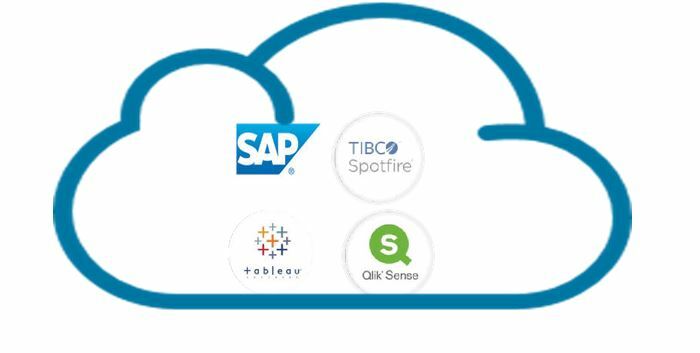 Tibco offers its service on-premise and cloud. It also provides preconfigured scalable architecture with low IT maintenance concerns. Qlik is known for its rapid creation of guided analytics application that supports user-driven data exploration to the lowest hierarchy of the data. It possesses its own repository and in-memory processing capabilities. It does have two variants QlikView and QlikSense. QlikView is the BI application building tool for personal and enterprise edition. QlikSense is the end to end application service for BI that can be integrated into the cloud. The data acquisition parameter involves data import, data extraction, data connection, and data access. In a simple way, you can say that its ability to acquire data from different sources or semantic services that could be SQL, Bigdata, Cloud Services. When we talk about tableau, and if you used it in the past you will have a glimpse of impressive visualizations that been created with an instant and even complex data explorations too. Tableau does not possess its own repository for data, it acquires data from different sources and converts it into meaningful and understandable visualizations. So to do so, it should have connectors connecting to different sources, and fortunately, it does. Tableau possesses more than 100 different data source connectivity also offering the live connection to transactional data. In data acquisition parameter it does have the upper hand. SAP possesses multiple products to support data acquisition that will act as a middle layer to provide data to final visualizations. But talking about the Lumira and Analytics, cloud it does support connectivity to more than 60 data sources as for now which will undoubtedly increase with time. 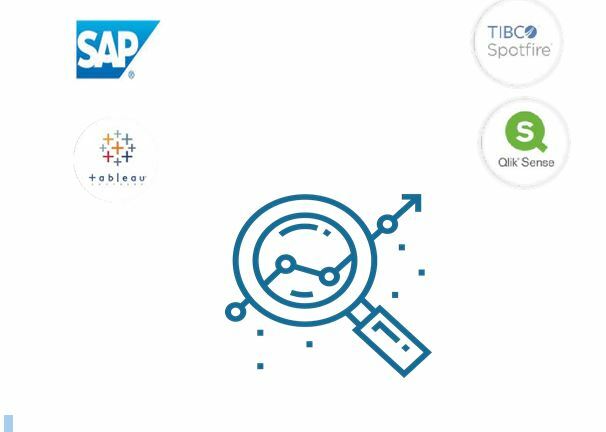 SAP does not have any problem to acquire data from its ecosystem, in fact, it will be the smoothest work to acquire data from its own ecosystem. When we talk about acquiring data from a different ecosystem, its do possesses tools that help to move data, but it also adds extra work and skills. 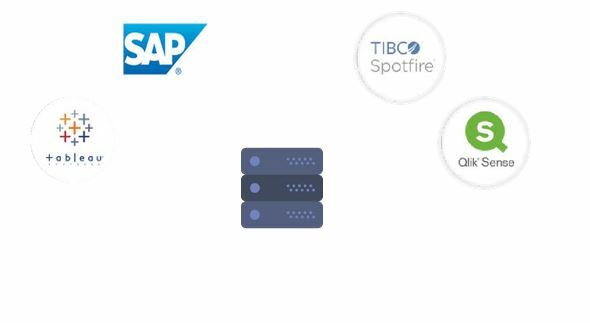 Spotfire is one of the most powerful and sometimes complex tools, when comes to acquiring data it does have 40+ data source connectors and things always work out with JDBC and ODBC connectors. It does support Bigdata and cloud connectors which provide data efficiently. Issues in data acquisition arise when there is a need for data cleaning before acquiring it. Qlik is one of the growing market leaders in BI. When comes to acquiring data, Qlik does have a large number of data source connectors divided into different groups. Qlik possesses its own repository for acquiring data and performing ETL (Extraction, Transformation, and Loading). That solves a ton of issues in real life scenarios. The data manipulation skills of Qlik helps to ease the presentation of data an easy process. After acquiring data comes the step for preparing it. It’s the dirty work that no one wants to do, but you can’t skip it in any case. It comprises merging data, cleaning, modeling to a level where we can create a descriptive report on the data by a simple select query. Tableau does possess a good amount of data preparation technique to convert data into a presentable report. You can find all the details in 2nd and 3rd Section of this tutorial. The SAP does again possess different tools to prepare data. It does have a BW system that is powerful enough to handle data preparation to a possible extent. With the arrival of HANA, it gains immense power in handling large data with in-memory engines. But that is a separate tool with separate skill sets. You can visit here to have a glimpse of BI aspect of SAP. Data wrangling capabilities of Spotfire is very good along with automation of the models that help incremental data preparation process easy with less interference of IT. By saying incremental data preparation, I mean to capture the change in data from different sources and preparing data based on that change. Please visit here to have a detailed view. Qlik does possess the data preparation capabilities similar to Tableau along with its in-memory engine. Separate scripts can be written according to the need of the requirement and implemented at different levels. If you a glimpse of scripting that helps in transforming data, please visit here. Now we get to the fun part at least of mine. We acquired the data and the preparation it but to analyze that much amount of data we need visualizations to save a significant amount of time and get to the issues in a much faster way. A large portion of data exploration is done in visualizations and the rest using statistical methods. Now see how tools perform on this parameter. Tableau possesses one of most variant data visualization components that are Comparison based, Distribution based, Composition based, maps, etc. It possesses almost all components and has been recognized worldwide for its supportive community. It also has some unique ideas along with its help in the learning process. One can find the required chart even custom ideas in its vast gallery. Please visit to have a look at some excellent charts and stories. Tableau is one of the tools that is certified by IBCS (International Business Communication standards) for using data visualization best practices to improve business communication. SAP Lumira is the most widely used tool in the aspect of visualization in SAP’s arsenal. It does cover all basic charting requirements along with extensions that help to modify according to requirement. SAP Analytics cloud recently got certified by IBCS and hope will continue to apprehend all requirements of visualizations. Spotfire provides all necessary functionality of charting covering all the charting groups for analyzing data in a visual format. Its advanced analytics functionality allows adding charts of statistical analysis along with scientific formats. Qlik performs well when charting capabilities covering almost every groups of charts comes. It provides extensions for modifying and adding requirements. It’s on click functionality for accessing every data point separates it from other tools. Now let’s get into the part where all analytics platforms are diving in, trying to accommodate the machine learning functionalities into their tool. Few are quite successful in it, and others did some good for a starter. Let’s see how much we get on this parameter. When talking about predictive analytics aspect Tableau started doing work in this area. Basic forecasting functionalities are added in the tableau. Along with basic functionality, it can be integrated with R and Python whose details are covered in the last sections of this tutorial. Again SAP provides a separate tool from its arsenal to provide a platform for predictive analytics. This tool covers basic predictive modeling with good time series analysis functionality intact. SAP primary went with R when it came to adding custom scripts that need to be added in the model being developed by the platform. For details on the platform, please visit here. Spotfire in terms of predictive analytics would be in the lead, its approach towards accommodating data science architecture to its own is quite evident. The skill requirement along with knowledge to understand the technology and implement it. It combines the methodologies of data science and statistics to produce a tool that can perform predictive analytics with the proper return of investment. To read more, please visit. Qlik is also working to implement predictive analytics to a reasonable level. It implemented few basic modeling algorithms in its system but the skill gap to use it is still striving. Although its integration efforts with R and python is quite appreciating. It allows data exchange with 3rd party tool like R and python along with the use of its Associative engine that makes data transfer quick and efficient. It also has open source analytic connection on GitHub for integration with R and python. So that’s all from my side, it all depends on an individual or organization that which parameter is most important for choosing a platform. If you would like to learn more about Python, R, or SQL, take DataCamp's intro courses.